DUBAI, 7th January, 2018 (WAM) -- The Vice President, Prime Minister and Ruler of Dubai, His Highness Sheikh Mohammed bin Rashid Al Maktoum, has chaired the first Cabinet session of the new ‎year and highlighted the importance of choosing the year 2018 to be the "Year of Zayed". His Highness ‎affirmed that "the achievements of the UAE today are the fruits of the vision of our father and the ‎leader, the founder of the UAE". He added that "President His Highness Sheikh Khalifa bin Zayed Al Nahyan's directives to dedicate this year to our Founding Father is an opportunity for us to translate the ‎values that have been instilled in us into further achievements that serve our people and our country." 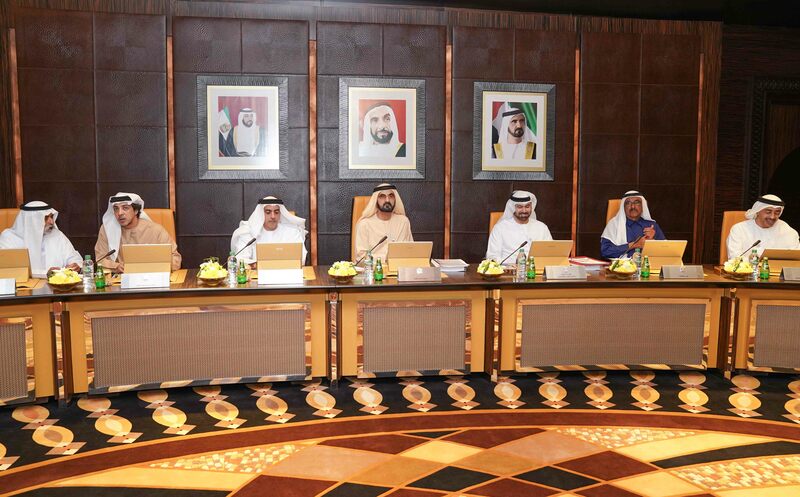 ‎ The Cabinet reviewed the developments in the implementation of the value added tax, VAT, in the UAE and reviewed the plan to distribute the revenues collected from the value added tax to local governments to ensure that tax revenues are used to support development projects that serve and meet the needs of the community. "We have decided to distribute value added tax revenues in the UAE so that local governments will receive 70 percent of these revenues to achieve better local services, greater community development, and wider support for our citizens," Sheikh Mohammed continued. "The government will be transparent about the nature of these projects and firm in controlling the markets to prevent price hikes, and will continue to consult with citizens in order to serves their interests in the first place," he affirmed. The Cabinet also adopted the UAE Water Security Strategy 2036, which aims to ensure the availability of water in sufficient quantities and safe quality in accordance with international standards during normal and emergencies situations. The strategy includes a list of measures for enhanced water supply including, alternative water sources, emergency water production and distribution, storage mechanisms and water networking across the UAE and a number of legislative items. The Cabinet also adopted the 'Manual on Measuring Productivity in the Federal ‎Government', which ‎‎‎explains the mechanism of performance and productivity in ‎the federal ‎government. It includes ‎‎directives for all ministries and government ‎‎entities to understand and measure the productivity of the ‎‎governmental ‎sector. ‎ In organisational affairs, the Cabinet approved the appointment of the Board of Directors of the Federal Authority for Nuclear Regulation. 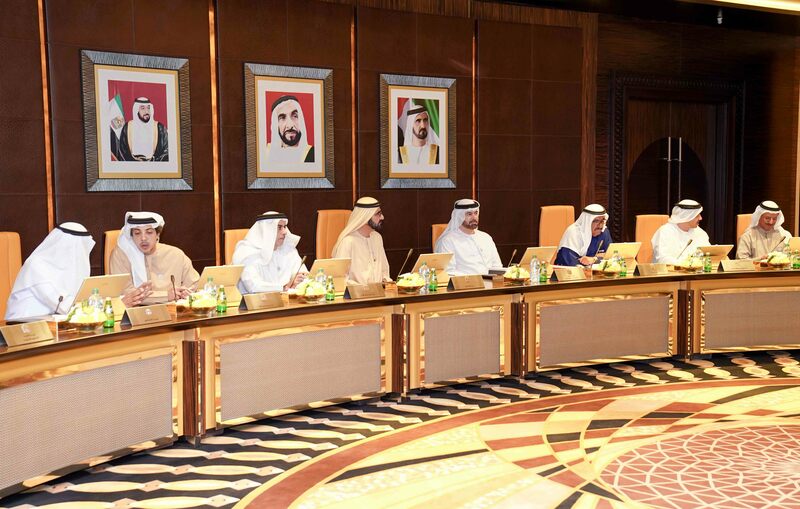 It also approved the restructuring of the Judicial Coordination Council to achieve coordination among all judicial entities in the UAE, and to ensure the exchange of knowledge in the areas of judicial and legal affairs. The Cabinet also approved the estimated budget of the General Authority for Pensions and Social Insurance for the fiscal year 2018. Concerning international relations, the Cabinet agreed to upgrade the diplomatic representation office of the UAE in Bonn, Germany, to a General Consulate. It also adopted and ratified a number of international conventions, including ratification of the Convention on Cultural Cooperation with Ukraine, an agreement with Switzerland on the exemption of a short-stay visa for holders of ordinary passports, and an agreement on reciprocal protection of investments with the Government of Moldova, as well as two conventions on the avoidance of double taxation and the prevention of fiscal evasion with regard to income taxes with both the Government of Moldova and the Government of Croatia.